Clarence Lamb, 23, a resident of #2 Wagner’s Lane, changed 8 of his 10 not guilty pleas to guilty when he appeared in court this morning, and later changed the remaining two when the trial, which was set for today, was about to start. At 4:30 on the evening of January 2, 2013, a cashier of the Belize Tourism Board’s Regent Street office, was reportedly at her desk when two Creole-looking men walked into the office, one armed with a knife, the other with a gun. Both men demanded money from her, and fearing for her life, she handed over two cash pans – a purple one containing $300 cash, and a blue one containing $1,432.78 cash, money which belonged to the BTB. After getting the cash pans from the cashier, the men reportedly “ran into” the BTB’s security officer, Edwin Torres, and assaulted him with their gun. Armed with his service firearm, Torres chased after the fleeing men and managed to shoot one of the robbers, causing him to fall to the ground. That injured man was later identified as Lamb, and he was subdued by security officers from the BTB, who were also able to retrieve a .38 revolver from him. The two cash pans were recovered as well. Lamb was taken to the Karl Heusner Memorial Hospital, where he was treated for his injury and later charged for keeping an unlicensed firearm and keeping (6) .38 rounds of unlicensed ammunition. He was later charged with the robbery of the cashier, and with seven counts of aggravated assault with a firearm. 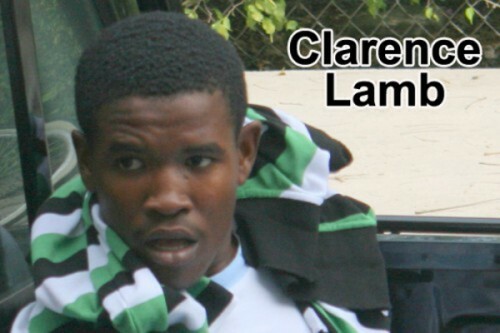 On January 7, Lamb, who was 22 at the time of the robbery, was arraigned before the Chief Magistrate, and pleaded not guilty to all ten charges. He was remanded to prison, but was later offered bail, which he met. This morning, when he arrived at court, he informed the prosecutor that he wished to change his pleas, which he was allowed to do. After the facts were read to the court, in his mitigation plea, Lamb told the court that he had nothing much to say, but asked that they exercise leniency toward him. After he presented his mitigation plea, Lamb was sentenced to 12 years for the robbery, 10 years each for the firearm and ammunition charges, and 2 years each for the seven aggravated assault charges. However, he will only spend 12 years in prison because the sentences are to run concurrently.